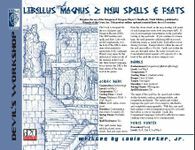 This PDF includes new spells and feats. Like with all d20 supplements, it is the duty of the DM to determine what material is appropriate in his campaign. Players may argue for the inclusion of some (or all) of the material in this book into their current campaign, but as always, the DM is the final arbiter of the rules used in his games. List of new spells include: Acidic Rain, Babble, Force Vortex, Minor Force Ward, Razorpaper, Protection from Force, Resist Force, Rust, Spray of Blades, Spray of Needles, Water Blast, and Wave of Force. List of new feats include: Spell Effigy (Special) & Stunning Spell (Metamagic).